When Bankers Wore Boots and other artwork by artist G. Harvey can be viewed in our artist slideshow. When Bankers Wore Boots by artist G. Harvey and other Gerald Harvey art, art work, artwork, canvases, giclees, images, limited editions, open editions, paintings, paper, pictures, posters, and prints can all be found at Christ-Centered Art. 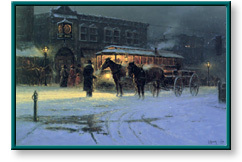 When Bankers Wore Boots depicts a downtown street in the Old West as wintry weather closes in. Street lamps are aglow through the icy fog, while a trolley car screeches to a halt near the bank as home-bound passengers climb aboard. Image Size 14.25" x 21.75"
This unframed limited edition paper print is in new condition with rich colors. It has no creases, rips, or dents, and is individually numbered and hand signed by the artist G. Harvey. However, it doesn't come in its original folio which had a sticker which served as the certificate of authenticity for G. Harvey prints published by Texas Art Press. This piece was originally framed, but a framer cut the bottom white border of the print just under the title to fit the print into a smaller frame. This cutting affects the value of the print from an unframed standpoint, but once you have it framed, you won't notice the difference from the pristine listing below. Pictures are available upon request. This unframed limited edition paper print comes mint in its original folio, includes a genuine certificate of authenticity from Texas Art Press, and is individually numbered and hand signed by the artist G. Harvey.